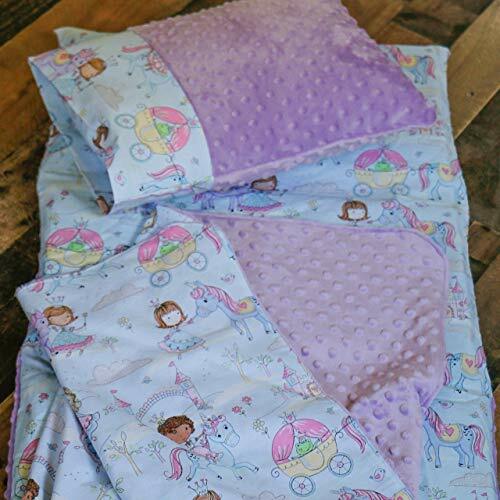 Princess Unicorn kindermat cover set Set includes nap mat cover - blanket and envelope pillow case. Super easy and portable make it great for bringing to school, a friend's house, or that weekend sleepover at grandma's house! Each set comes with a nap cover, blanket and pillow cover but does not include an actual nap mat or pillow. One side is soft bubble minky and the other is cotton fabric. Mat cover fits Kindermats 5/8"x19"x45", 1"x19"x45", and 2"x19"x44". Pillow case fits a standard toddler/travel size pillow 12x16, and the blanket is 30x36. Pillow, blanket and nap mat are individual pieces, not attached to each other. With an envelope pillow case you do not see the pillow at the end, a flap on the inside of the pillow case covers the pillow. This looks better and it keeps your little tots pillow in its case. This is the perfect gift to allow your little one to bring a piece of home with them wherever they go. This is a great comfort idea for any kid to have. Easily removable with a envelope closure at the bottom and washing machine safe. If you have any questions about this product by Carli's-Closet, contact us by completing and submitting the form below. If you are looking for a specif part number, please include it with your message.